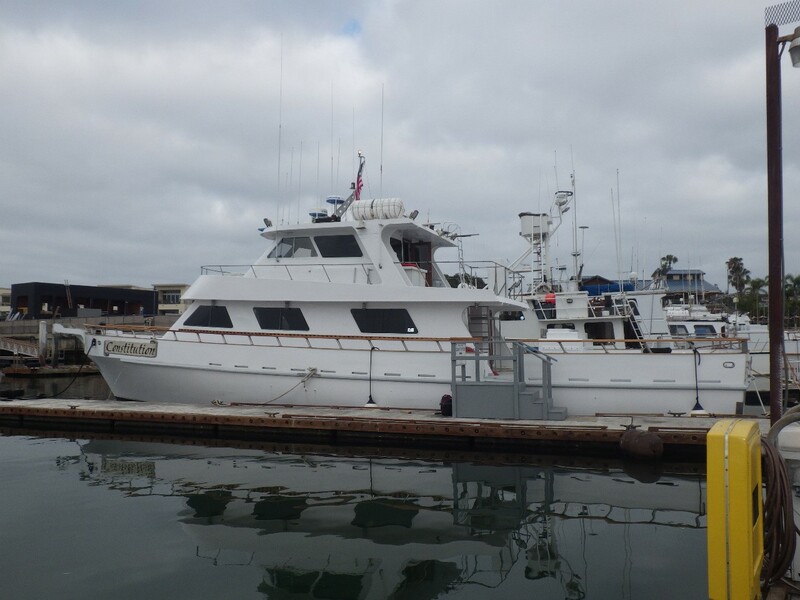 76' Aqua Bay Marine passenger vessel | Christian & Co. This inspection was performed upon the request of the client listed above on July 7, 2016 while the vessel was hauled at XXXX San Diego, California and afloat in San Diego, California and the client and the current owner attended. Layout/interior components: Open cockpit with bait tank forward, walk around side decks, ladder to port between lower deck and upper deck. Enclosed pilothouse forward on upper deck, open aft deck and walk around deck on exterior of pilothouse, ladder to starboard to hardtop. Door forward on aft deck to saloon, hatch with ladder down to engine room to port of door to saloon, head to port and starboard forward on aft deck. Pilothouse has crew cabin to port aft and helm forward. Saloon has galley to starboard aft and seating forward. Ladder to bunk room on center of saloon, bunk room on lower level with escape hatch forward. Comments: The vessel was inspected while hauled and afloat. The hull bottom was visually inspected and randomly sounded. The hull bottom is in satisfactory structural condition. The hull bottom had heavy marine growth and was not pressure washed at the client’s request. There are blisters visible through the marine growth. They were not counted but there are over one hundred blisters, with an estimated half of them over 2” in diameter. None were probed but based on our experience they originate within the laminate. The hull sides and transom were visually inspected and randomly sounded. The hull sides and transom are in satisfactory structural and cosmetic condition. There is no HIN on the transom. There is miscellaneous damage about the bow plank including cracks near the connection to the hull and an apparent crack on the edge and weeping rust stains. There is rub damage through the paint on the starboard hull side. I did not see a documentation number displayed. The deck and superstructure were visually inspected and randomly sounded. The deck and superstructure are in satisfactory structural and cosmetic condition. There was a soft spot found when walking on the port side of the flybridge deck. The sides of superstructure are unfair / wavy. There are cracks in the paint about the windows and the port side of the superstructure. There were soft sounds when percussion testing the sides of the flybridge deck and the bottom of the overhang. There appears to be a paint patch on the port forward corner of the superstructure and a deep scratch on the starboard side of the forward edge of the superstructure. There is damage about the top of the bulwarks at the forward safety rail connection on both sides of the bow plank. The deck hardware including safety rails, mooring devices and hatches was visually inspected and most hatches and the port lights were opened and closed. Overall the deck hardware is in satisfactory condition. The cleats are mounted externally. The structural reinforcements including the stringers and bulkheads were visually inspected and randomly sounded. The structural reinforcements appear to be in “as-built” condition. There is moderate damage to deck beams overhead in the engine room and aft. Damage includes moderate deterioration and dark discoloration (possibly heat). The bilge is holding minimal water; the origin of the water is beyond the scope of this survey. The interior cabin spaces are neat, clean and orderly. The interior of the vessel is in satisfactory cosmetic condition. This survey is not a mould inspection. The condition of the coring, in the deck, hull and elsewhere as applicable is beyond the scope of this survey. Comments: The engines and transmissions were visually inspected and tested during a brief operation from the slip to the boat yard. This survey is not a mechanical survey. Please consult with a qualified mechanic for greater detail as to the condition of the machine systems. The current owner reports that the engines were replaced three years ago by a prior owner. The external surfaces and peripheral components of the engines and transmissions appear satisfactory. There are salt crystals on the port engine’s seawater pump. There was a problem priming the engines’ seawater pumps following the haul out. There was oil about the PTO forward on the port engine. The engine controls functioned normally. The exhaust system is properly arranged and installed. There are salt crystals on exhaust hoses for the port engine near the bulkhead. There is similar but lesser condition to starboard. There have been fiberglass repairs on the exhaust components. The propulsion components including the propellers, propeller shafts, struts and shaft seals were visually inspected. The propellers were percussion tested and spun with a fixed object adjacent to the blades. The propeller shafts were manipulated in the struts and observed while underway. Overall the propulsion components are in satisfactory condition. Both propeller shafts were off center in the shaft tubes as visible from below, while the vessel was hauled. The sacrificial zinc anode previously installed forward on the port propeller shaft is missing. The steering system was visually inspected and test operated. The steering system functioned normally. There is “Splash Zone” about the starboard rudder port. The port rudder port is leaking water slightly. The engine room blowers were energized. The generators were visually inspected, test operated and loaded. The starboard generator overheated and turned itself off during the brief operation from the slip to the boat yard. There is surface rust on the port generator. The through hulls were visually inspected and the valves were manipulated. The through hulls are in satisfactory condition. There are several unused through hulls and there is an unused and uncapped through hull in the pump room. There are stains and salt crystals on the freshwater pump and water heater to starboard forward in the engine room indicative of a leak or leaks. The seawater systems were visually inspected and most components were tested. Overall, the seawater systems are satisfactory. The electric bilge pumps were visually inspected. They were not test operated. The float switches are for the high water alarm, they do not energize the bilge pumps. The fire pump and engine driven bilge pump were not tested. A plastic sea strainer for the air conditioner is mounted directly to a through hull in the bunk room bilge. It is not a high traffic area. The transom zinc anode is covered with marine growth. Comments: The fuel system including the tanks, fill, vent, feed and return lines was visually inspected as installed. Where visible the fuel system components are in satisfactory condition. The condition and age of the fuel (and water) and the integrity of the tanks (fuel, water, holding) and hoses is beyond the scope of this survey. Please consider filling all tanks for a simple, practical test of their integrity. The water pressure system functioned normally. Accuracy of tank level gauges is beyond the scope of this survey. There are salt crystals on the aft head pump. The holding tanks are currently set to drain immediately overboard, the starboard drain valve has no handle. Comments: The electrical system including the shore power cord, batteries, wiring, circuitry components and circuit protection equipment was visually inspected and most components were tested. Overall the electrical system is in satisfactory condition. The condition and age of the batteries is beyond the scope of this inspection. A crew member stated that all batteries were replaced in the last sixth months, only two batteries were tagged and they were tagged 7-15. The circuit protection system is confusing. The crew member was unsure what many of the circuit breakers did, many he has never energized. Many of the circuit breakers are labeled “do not turn on”, some of the labeling is temporary. At least one of the circuit breakers labeled “do not turn on” was in the “on” position. There are plastic wire ties used to bundle wires in the engine room. The water maker control panel wires are disconnected and the water maker appears to be “rigged”. The water maker was not tested. The starboard generator battery has a loose terminal connection. There is corrosion on the exterior light fixtures and the port forward exterior light stopped illuminating during our survey. Work was being performed on the refrigeration system during the survey including the addition of refrigerant. A cover was removed from a junction box in the refrigeration / pump room. There are several unsecured junction boxes on the hardtop. There was no power to a G.F.C.I. outlet to starboard in the pilothouse. The pilothouse radio bank is not properly secured. There is an open ground to an electrical outlet near the coffee pots in the saloon. There is reversed hot and neutral at two outlets in the galley. The face plate is missing from one of the outlets in the galley. There is no power to a G.F.C.I. outlet near the sole in the galley. The sonar tube would not lift as designed and had to be lifted manually. Comments: Safety equipment for firefighting protection appears satisfactory. There is no tag on the starboard fixed extinguisher but this may be because the two bottles act as one unit. The fire cylinder emergency release to port forward on the aft deck has a broken glass cover. Personal flotation devices appear suitable for offshore use. We did not count or inspect all of the life jackets. There is a label indicating that there are life jackets located below the saloon bench seats though there are none located in that location. There are life jackets located in the locker forward, above the bench seats. Many life jackets are stored below the aft bunk berths but there are no labels indicating their location. Current distress signal flares are aboard. We did not test any sound signaling devices. The navigational and anchor lights are properly arranged, installed and functional. The ground tackle including the anchor and rode was visually inspected as installed and appears satisfactory. The entire length of the anchor rode was not inspected and should be inspected prior to use. There is a line drum on the windlass and the anchor rode includes chain. The vessel was reportedly built on the East Coast at Aqua Bay Marine though no research was performed regarding its origin. The current owner purchased the vessel in October 2014 in San Diego. The engines were replaced prior to his purchase of the vessel. The vessel has a current certificate of inspection that lists 97 passengers and zone two. The current owner stated that he has replaced all of the windows except the three forward windows, added the Mahogany hand rail and refinished the deck. The vessel was briefly test operated, inspected while afloat and inspected while hauled. The vessel is basically structurally and mechanically sound. The vessel is actively involved in passenger fishing charters and is suitable for that application. The actual cash value is the value that our research approximates the selling price of this vessel should be, at the time and place of our inspection. Consideration is given to vessel’s condition, geographic location, published listings and guides, comparable sales and listings, and market conditions. The new replacement value is the cost of this or a similar, new vessel, comparably equipped. The investment is the reported investment including purchase price and significant upgrades. No values include maintenance costs, storage or tax. The cleats are mounted externally which is extremely unusual. Monitor and modify if necessary. Determine the significance of the soft sounds on the edges of the flybridge deck and the bottom of the overhang. Repair as necessary. Determine the significance of the soft spot when percussion testing while walking on the port side of the flybridge deck and address as necessary. Display the documentation number per federal regulations. Display the HIN on the transom per federal regulations. Consider obtaining a valid HIN which complies with the format as dictated by the U.S. Government. Either repair the blisters on the hull bottom or monitor and repair as necessary. The hull bottom was not pressure washed for the survey. Service as a result of the surface rust on the port generator and eliminate any leaks. Remove rust stains to allow detection of any future weeps or leaks. Service to eliminate any leaks at the exhaust hose connections including the port engine’s exhaust hose connection near the aft engine room bulkhead. Remove the salt crystals from all exhaust hose connections to allow detection of any future weeps or leaks. Service as a result of salt crystals on the port engine’s seawater pump. Remove the salt crystals to allow detection of any future weeps or leaks. Eliminate the leaks onto and about the freshwater pump and water heater to starboard forward in the engine room. Eliminate salt crystals and staining to allow detection of any future weeps or leaks. Remove the “Splash Zone” about the starboard rudder port, inspect and properly repair / replace components as necessary. Service to eliminate excessive water leaks through the rudder ports. Cap or plug all unused through hulls including one in the pump room. Inspect the propeller shafts while the vessel is afloat. Determine if they are in contact with the propeller tubes, eliminate any contact. Have a qualified marine electrician inspect the electrical system and assure that it is suitable and in compliance with A.B.Y.C. (or similar) recommendations. Properly label all circuit breakers. Eliminate any liabilities particularly those arising from energizing circuit breakers as many are labeled “do not turn on”. Replace plastic wire ties used to secure bundled wires in the engine room with metal wire ties. Test and prove the water maker properly functional. The control panel wires have been disconnected and the water maker was not tested. Properly secure the loose wire connection on a terminal for the starboard generator battery. Assure that the fish box / refrigeration system is properly functional, refrigerant was being added during the survey and the system was only tested by reducing the temperature in the port fish box minimally in a short period of time. Secure all loose electrical junction boxes on the hardtop. The G.F.C.I. outlet to starboard in the pilothouse near the galley sole had no power. Assure the electrical outlets potentially exposed to water properly protected with G.F.C.I. devices. Properly secure the pilothouse radios. Return the cover to the electrical junction box in the pump room. Service as a result of the open ground condition on the outlet under the coffee ports in the saloon. Service as a result of the reversed hot and neutral condition at two outlets in the galley. Install a face plate on an electrical outlet in the galley where the face plate is missing. Service and prove the extending sonar properly functional. There was no tag on the starboard fixed fire extinguisher in the engine room, assure this is by design or inspect and tag as necessary. Either modify the windlass to include the chain drum or exercise extreme caution when using the windlass as the line drum is not designed for use with chain. Assure that the vessel is equipped with the proper number of life jackets and label their locations. Replace the broken glass cover on the emergency fire cylinder release to port forward on the aft deck. Determine why the starboard generator overheated during its brief operation and address appropriately. The certificate of inspection lists 1950 h.p., this is incorrect, modify as necessary. Monitor the moderate damage to the deck beams overhead in the engine room and aft. Repair / reinforce as necessary. Several repairs have been accomplished in the past. Address the damage to the top of the bulwarks at the forward safety rail stanchions. Address cosmetic issues as desired including the scratch on the starboard side on the forward end of the superstructure, an apparent patch on the port forward corner of the superstructure, unfair sides of the superstructure, rub damage on the starboard hull side etc…. Overall the vessel is in good cosmetic condition for a passenger fishing vessel. Determine the significance of the damage about the bow plank including cracks near the base and on the bottom edge and weeping rust stains and address appropriately. Consider relocating the plastic sea strainer for the air conditioner mounted on the through hull in the bunk room bilge. The primary liability is physical damage to the strainer. Provide a cover for this bilge access. Replace the forward zinc anode on the propeller shaft as desired. Two zinc anodes are sufficient but a third has previously been installed and is installed to starboard. The transom zinc anode is covered with marine growth and should not be covered with marine growth. Determine why this condition exists and address appropriately. Remove oil, reportedly installed, near the PTO forward of the port engine. Determine if there are any existing leaks and address appropriately. Address any damage done to impellers when they would not prime themselves following the haul out. Assure that the installation is proper as the pumps are above the waterline and the top of the sea strainer. Shut through hulls during future haul outs to prevent a repetition of this problem. Modify the installation if / as necessary. Address corrosion on the exterior light fixtures and service and prove the port forward exterior light functional. Service as a result of salt crystals on the aft head pump. Eliminate any weeps or leaks. Remove salt crystals to allow detection of any future weeps or leaks. Close the through hulls for the holding tank drains to comply with federal regulations when within three miles of the coast. Assure that the starboard waste drain through hull valve functions and provide a handle for the valve. The following components were not tested or inspected: engine drive bilge pump, sound signaling devices, fish hold refrigeration system (port side tested briefly), windlass, fire pump, water maker, fuel transfer pump, all functions of entertainment equipment and all functions of navigational electronics.